Yesterday marked 6 months exactly to the day that I first pulled on my trainers and set off for my very first run of week 1 of C25K and I marked my 6 month anniversary with my first proper race - the Supersonic 10K for the Bournemouth Marathon Festival. Down to the start pens and found myself about in the middle of the first bit of the blue pen - I couldn’t see Aliboo’s snazzy green vest but was behind a group of runners in jewelled running tops and in front of two gents chatting about all the half and full marathons they’d done in the past - surely I wasn’t in the right section! The countdown to the start came pretty quick and before I knew it the front runners were off! We eventually started moving forwards and the start line was approaching… I started to run and then had to promptly stop again as Mr and Mrs Sparkly top set off at a walk. I squeezed past and was off! I think I found a fair pace pretty quickly and trotted through the first km in 5.54. I’ve lived in this area all my life but I’d forgotten quite how lovely the golden sands of Bournemouth beach are - a stunning place to run! 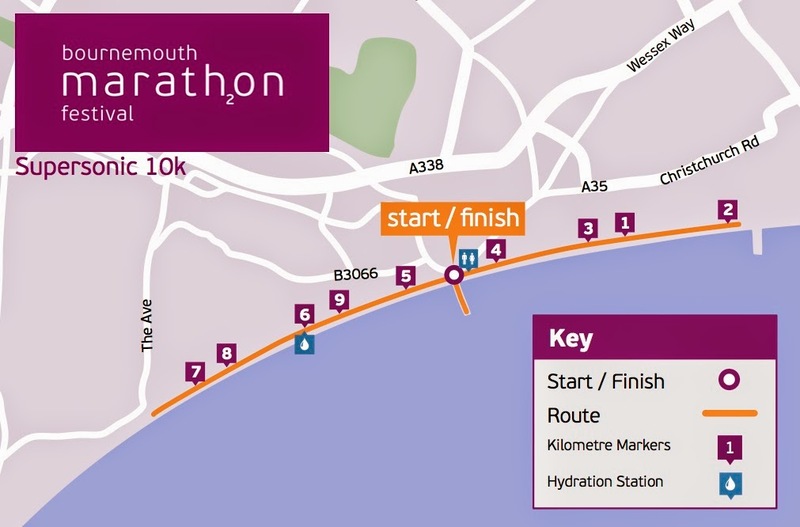 I found myself meandering past quite a few runners which was quite satisfying and made my way towards Boscombe pier where we would turn just before the pier at about the 2km point for 5.59. There was some great support at the turn! The run back towards the start area seemed really hard going - I’m not used to running in a straight line or an up and back route and the lack of landmarks other than in the far distance seemed to make the prom go on forever! Km 3 and 4 were in 6.00 and 6.05 respectively and soon we were back at the start area. Again there was some fantastic crowd support and a bit of a windy section led us up onto the pier and it was like someone flipped a switch in my head - suddenly I was having a ball! Running up onto the pier on the wonderful wooden surface with the zip wire over head was just fantastic and I’m pretty sure I ran round the pier with a big cheesy grin on my face! The half way point came with a 6.03km and just over 30min for the 5K - happy with that and pushing on for the second half. Heading down towards Poole there was more great support including some drummers who got a big grin from me! Great atmosphere and really fab support from the marshals too! I ignored the water station and a 6.02, 6.08 and a 6.00 to take me around the turn for the home run and to 8km. At this point I felt like I was putting my foot down as I passed lots of people. km 9 was in 5.59 though so maybe everyone else was just slowing down! The 9km came into view and I was feeling ok so tried to pick up the pace a bit for the finish! My last km was 5.44 and tried a little sprint up to the finish! So happy to have finished in a fair time according to Ms Garmin , I'm also really happy how even my pace was throughout the race. We were funnelled efficiently up to the medal and tee collection area and to get our goody bags. I grabbed some water, downed a bottle and jammed the free almond and apricot bar down my neck. I hate both almonds and apricots - it’s amazing what you’ll eat after 6 miles of running! It really hit the spot! All in all I had a wonderful day and I’ll definitely back for more races! The fabulous medal alone was enough to make me want more and more bling! The tee is fab too and I’ve proudly been wearing it today - I may never take it off! My final time was 60mins 4sec only a few seconds off my pb so I’m thrilled with that for my first time running with real people! That placed me at 676 out of 1322 and in my age category (who on earth thought it was fair to call the over 35s ‘veterans’??) 44 out of 113. I really can’t complain and feel really proud of how far I’ve come in such a short period!